A well good job, by Dr. Allen & student. Wait time a little long. Thanks to Mr. Al for helping w/my chart. A well good job, by Dr. Allen & student. Wait time a little long. Thanks to Mr. Al for helping w/ my chart. My visit was very nice, the staff were very nice, the office was clean. When meeting Dr. Allen as her enteringthe room. She extended her hand for the shake which I did appeciate very. All of her service were very, very resectfull. Thanks Dr. Allen stay the same. My visit was very nice, the staff were very nice, the office was clean. When meeting Dr. Allen as her entering the room. She extended her hand for the shake whichI did appeciate very. All of her service were very, very resectfull. Thanks Dr. Allen stay the same. 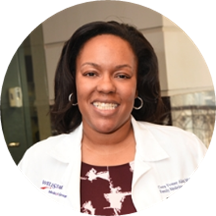 Dr. Cierra Allen is a dedicated and diligent family physician and primary care doctor in Morrow, GA. She received her bachelor’s degree from Spellman College in Atlanta, GA. She received her medical degree from the Boston University School of Medicine in Boston, MA. Dr. Allen completed her family medicine residency at Atlanta Medical Center in Atlanta, GA. Dr. Allen is certified in basic life support, advanced cardiovascular life support and Merck Nexplanon. She is a member of the National Medical Association, American Academy of Family Physicians and the Georgia Academy of Family Physicians. Dr. Allen currently is in practice with WellStar Family Medicine – Morrow. I love the Dr's here they are awesome and really caring. I was very pleased with it, she gave me amp time.